In the Star Trek: The Original Series episode, “The City on the Edge of Forever,” Dr. Leonard “Bones” McCoy travels back in time to 1930s Earth and changes history, creating an alternate reality. Might his tampering have had more lasting effects than we realize? As I have mentioned in previous postings, Star Trek, for the most part, has a very specific way of dealing with time travel. That is, in Star Trek, time is treated as “plastic,” something that is quite malleable. Trek treats time as existing on a line, a timeline, and if you alter that line, it cancels out what existed in that line previously. Other works of science fiction depict the altering of time as creating new quantum realities, in other words, when you change the past of one reality, it doesn’t destroy the old one; a new parallel reality is created instead. Star Trek, of course, is not without its inconsistencies. Some might even call it a trademark of the franchise. Generally speaking, in Star Trek, any dabbling with time travel involves an altering of the “timeline.” However, as early as “The Alternative Factor,” and later in another Original Series episode, “Mirror, Mirror,” alternate realities, parallel with ours, are shown to exist. So that leads one to draw the conclusion, that while Trek lore subscribes to the idea of multiple, co-existing parallel quantum realities and alternate dimensions, that “our” Trek universe has its own timeline, that can be twisted, manipulated, and permanently altered. Depending on the means used for traveling through time, sometimes these changes creates alternate realities altogether; at other times they do not. 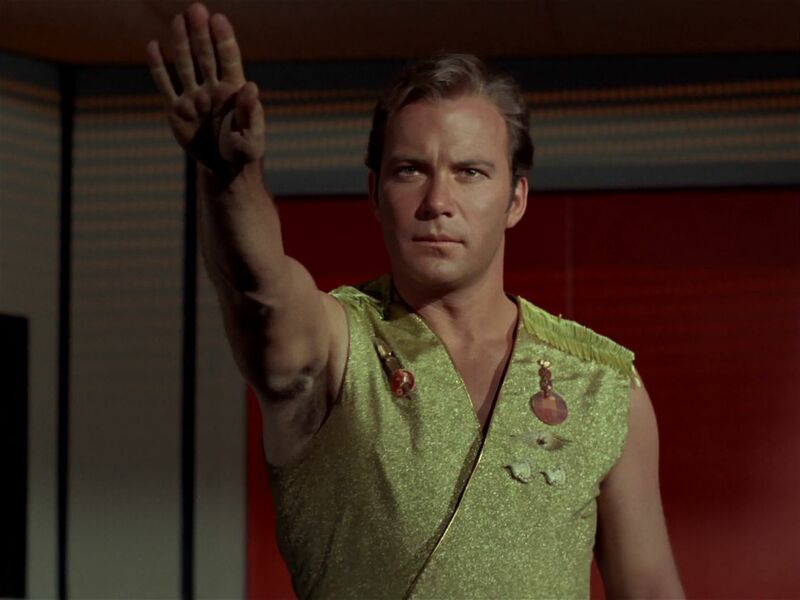 The Mirror Universe from Star Trek is given much more screen time than any other alternate reality from the franchise, and also seems to be more closely linked with “our” universe, than any of the others. Part of this is no doubt due to popularity, from fans and writers alike. But suppose, that there is a specific reason why it is so relatively easy to travel to the Mirror Universe… and suppose, that there is a specific reason why, that the Terran Empire is a direct mirror of the United Federation of Planets. When Dr. McCoy alters the timeline in “The City on the Edge of Forever,” he accidentally created an Earth history in which the Axis Powers won World War II. When Kirk and Spock follow him into the past, and prevent him from making the change, their reality is set back to normal. But the alternate timeline which Bones created, was at one point, real. 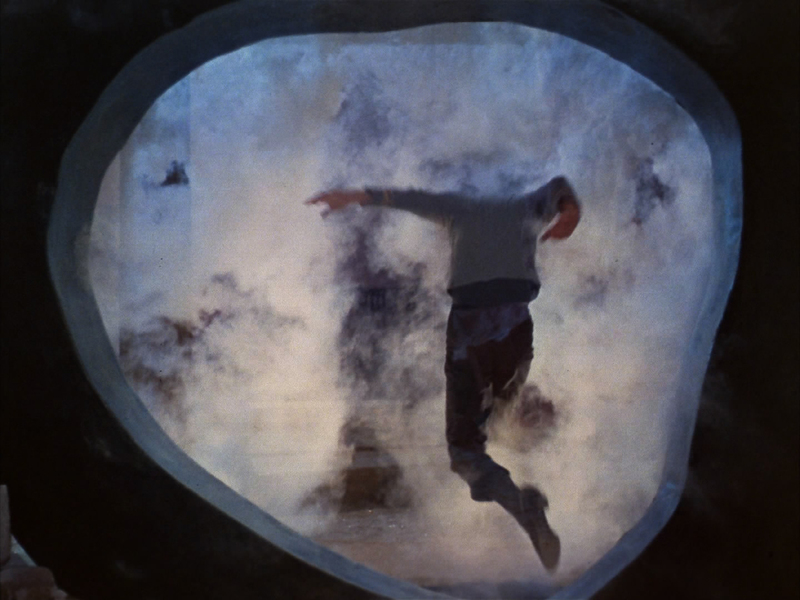 Before Kirk and Spock use the Guardian to jump back in time, the universe around them was one in which the Federation did not exist. Was it, in fact, the Mirror Universe? The rules of how time travel works with The Guardian of Forever are steeped in mystery. Was the new timeline which Bones created, permitted to continue existing on a parallel plane of reality? 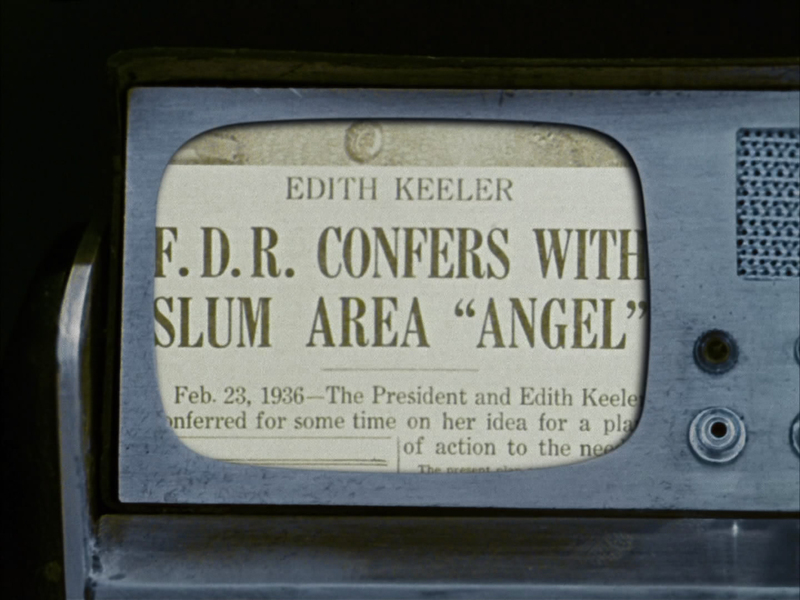 When the three men return from 1930s Earth, they were permitted to return to the “correct” universe, but does that automatically mean that the new, alternate reality was canceled out? Also, consider when Spock says that The Guardian of Forever had been sending out “waves and waves of time displacement.” If these waves traveled to specific regions of space, say, the Bajoran Wormhole, as well as above the Halkan homeworld, and weakened them just enough, it might have created points in the space-time continuum where the Mirror Universe and ours were more closely connected. This would make it possible to fairly easily jump between universes, as we see in various Mirror Universe episodes. Ponder this: The Star Trek: Enterprise episode “Through a Mirror, Darkly,” has an extremely intriguing use of historical footage in the opening title sequence, which briefly summarizes the history of the Terran Empire. Though the fact of whether or not this zany Mirror Universe episode is worth considering as hard canon, is debatable, the montage intrigued me. One historical clip came from World War II, which gave me the idea that in the Mirror Universe, the Axis did win that conflict. However, their new world order eventually collapses, leaving Earth in a similar state such as what we saw in Star Trek: First Contact. The Mirror Zefram Cochrane, still a genius and still the father of human warp drive, is raised on a much more savage planet Earth, one that had lived under the boot of Nazi aggression for decades. Instead of seeing the Vulcans as guests, and symbols of hope for a better future, the embittered Cochrane (and by extension, a much more primal and jaded humanity) sees the Vulcans and their technology as a stepping stone to power and wealth. Note how similar the Terran salute is to that of Nazi Germany. The agony booths, agonizers, and the secret police run aboard starships, also scream of what a future Nazi-esque power might employ. Along with Nazi Germany, the Terran Empire seems to have taken some cues from the Roman Empire as well, in both aesthetics, and in their sensual excesses. The Terrans hold the rest of the races under foot or by the collar, projecting the racism that used to be expressed toward fellow humans, onto other alien species. But, like the Axis regime before it, the Terran Empire makes too many enemies, and becomes too corrupted and stretched out to sustain itself. This process is helped of course, by Mirror Spock, who was convinced of the Empire’s fallacy by “our” Captain Kirk. The Empire collapses, and the rest of the galaxy seizes the chance to bring a terrible comeuppance to the Terrans. If the Mirror Universe were an exact reflection of ours, surely the Klingons, Cardassians, Halkans, and other races would be the opposite of what we know them to be. 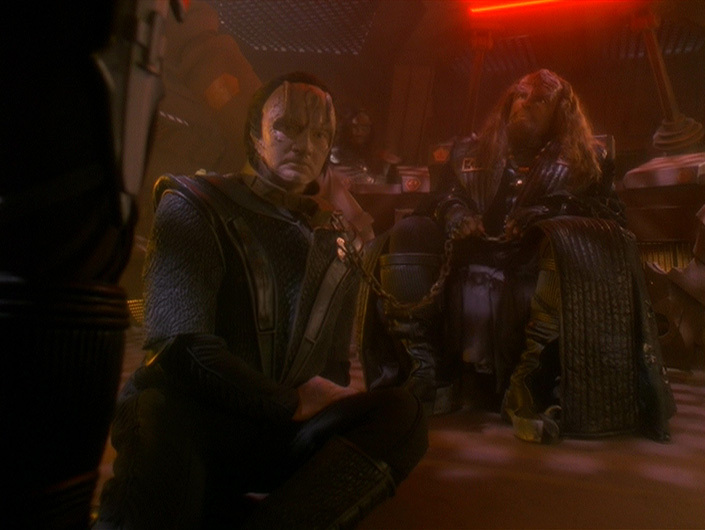 However, in the Deep Space Nine Mirror episodes, the Klingons and Cardassians are as vicious as ever, if not more so. In “Mirror, Mirror,” the Mirror Halkans are still a pacifist, non-violent race. These facts and more, tell me that the Mirror Universe is identical to ours, except for Earth’s history. That is, Earth’s history from 1930 on, thanks to Bones. That Bones did, as a fact, create the Mirror Universe, is never even hinted at as being true, in any dialogue from any episode of Star Trek. Rather, it is a hypothetical explanation for the existence and nature of the Mirror Universe, based on empirical evidence that, as Spock would put it, “happens to fit the facts.” This is meant to be a fun exercise in “food for thought,” something to ponder about the next time you watch the episodes “The City on the Edge of Forever” and “Mirror, Mirror.” I hope you’ve enjoyed this stimulation of your neurons. If you found it fascinating, or on the other hand, if you think that this blogger has lost his Trekked-out mind, feel free to comment below. Disclaimer: Star Trek is a CBS/Paramount Studios copyright. No copyright infringement intended. This article is for entertainment and informative purposes only. Images are courtesy of http://www.trekcore.com. Heh, I’ve thought this for a while, long before Enterprise’s ‘Mirror Darkly’ episodes. I really enjoyed reading this, particularly your pointing out that the other races are identical between the universes. The question that came up for me is a statement that Phlox makes in one of the ‘Darkly’ episodes that he checked the Defiant’s library computer and that Shakespeare is very similar, but he made it seem that they weren’t identical. Honestly I remember being disappointed when I saw that because that’s the one ‘canon’ thing that might disprove the theory since it’s supposed to be the same universe right up until Bones split the timelines. Anyways, I choose to believe your theory. I recall that Phlox’s comment was rather vague. Also, consider that Shakespeare in the Mirror Universe may not have survived translation very well. In all likelihood his, as well as other works of literature, would have been suppressed, altered, or damaged in a world taken over by the Nazis. Very neat idea about Bones & the Guardian of Forever. The opening title images from “Through a Mirror, Darkly” still show a HMS Enterprize from the 17th-18th century, suggesting the “Empire” could have existed then too, maybe even since/being the “Roman Empire” is a fun idea too. The different Shapespeare that Phlox mentioned could easily come from a “Darker” modern (to Phlox) translation of the same original Shakespeare. Could be, but even in our history, the Royal Navy commissioned HMS Enterprises and Enterprizes as early as 1705. One was a captured French vessel, L’Entreprise. Thanks for the reply, Xen. Glad you enjoyed the article. What if bones was actually from the mirror universe originally? I mean he did slip up and say that the Vulcan were conquered early in TOS. HE could have been an escapee like Like a was in Destiny.